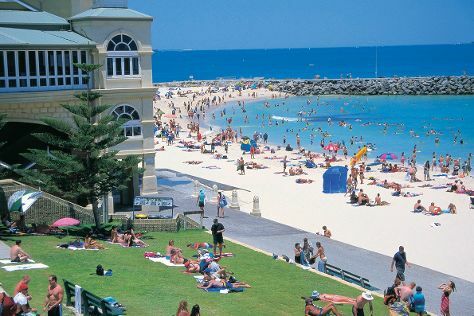 Relax by the water at Cottesloe Beach and Scarborough Beach. Step out of the city life by going to Dolphin & Whale Watching and Penguin Island. You'll find plenty of places to visit near Perth: Caversham Wildlife Park (in Whiteman) and Fremantle (Western Australian Maritime Museum, Fremantle Markets, & more). There's still lots to do: explore the activities along Swan River, stroll around Kings Park & Botanic Garden, don't miss a visit to Norm wrightson hairway, and pause for some photo ops at Kings Park War Memorial. To see ratings, reviews, and other tourist information, refer to the Perth trip itinerary builder . If you are flying in from United States, the closest major airport is Perth International Airport. June in Perth sees daily highs of 68°F and lows of 46°F at night. Finish up your sightseeing early on the 22nd (Sat) so you can travel back home.